The film had a notoriously troubled and chaotic production, involving multiple rewrites and recasts, and received negative reviews for the script, acting, and unrealistic stunts, whereas the high production values, action sequences, shooting locations, and the musical score were praised. It was a box office bomb having one of the highest losses when adjusted for inflation in film history at $147 million. It was the last film from Carolco Pictures before its closure. After scalping her dead father for the piece, Morgan, now the captain of her father's ship, the Morning Star, sets out for the treasure. Unfortunately, the instructions appear to be in Latin, which no one on board reads. So, they go to nearby Port Royal to find a translator. There, they learn that one of the slaves up for auction, a con man and thief named William Shaw, is fluent in Latin. After threatening a man determined to outbid her, Morgan wins the auction. Unfortunately, she is recognized from her wanted poster and is chased out of town, along with her crew and Shaw. Humiliated, corrupt Governor Ainslee vows to find her, either to arrest her or form a partnership for half her profits. He enlists the help of chronicler John Reed, who often follows pirates to write his books. The crew then goes to Mordechai in Spittlefield Harbor. Before they can learn where the second piece is, Dawg appears. A fight ensues, during which Mordechai is killed and Morgan is shot, while Shaw secretly finds the piece and keeps it to himself. After they escape on the Morning Star, Morgan collapses from her wound, but is saved by Shaw, who is a self-proclaimed doctor. The two start a romance. Morgan figures out that the words on the map, when read backwards, spell out half the coordinates to the island. Dawg's ship, the Reaper, bears down on them. Morgan directs hers toward a coral reef and a gale. Shaw manages to piece together the location of Cutthroat Island with his and Morgan's piece, but is caught and thrown in the brig. During the storm, Reed sends a carrier pigeon revealing their location to Ainslee. Meanwhile, the majority of the crew led by the treacherous Scully mutinies and maroon Morgan and those loyal to her in a boat. The tide takes them straight to Cutthroat Island, which is uncharted land northeast of Cuba. As Morgan goes after the treasure, Shaw, who escaped during the storm, steals the last piece from Dawg, who's on the island. Shaw falls into quicksand and Morgan, realizing he has the piece, frees him. Together, they find the gold, only for it to be stolen by Dawg, forcing them to jump off a cliff into the tide. After regaining consciousness, Shaw finds Reed, who leads him into a trap set by Dawg, Ainslee, and the mutineers, who have joined forces and intend to split the gold between them. As Shaw is captured and they make their way out to sea with the gold, Morgan sneaks aboard the Morning Star and retakes it from Scully and the mutineers. The crew then tries to sneak attack the Reaper, but Dawg counterattacks. A sea fight ensues, during which Shaw escapes and Ainslee, his men and Reed are killed by cannon fire. Morgan boards the Reaper and blows out the ship's bottom to get to the gold. She then duels Dawg while Shaw gets trapped below in rapidly rising water with the treasure. Morgan kills Dawg with a cannon and saves Shaw, forced to abandon the treasure to escape the sinking ship. Morgan attached a marker barrel to the treasure beforehand, allowing them to retrieve it and the newly rich crew sets sail for their next adventure in Madagascar. At the time the film was produced, Geena Davis and director Renny Harlin were married. Harlin convinced producer Mario Kassar to cast Davis, who was known for light comedies, in hopes that it would turn her into an action-adventure star. Carolco, already deeply in debt when the film entered pre-production, initially budgeted $60 million for Cutthroat Island and pinned its hopes for survival on the success of the film. To fund this endeavor, the cash-starved company cancelled its only other project under production, "Crusade" starring Arnold Schwarzenegger, losing $13 million in the process but freeing up additional money for Cutthroat Island. It also sold a $20 million interest in Paul Verhoeven's Showgirls, and aggressively marketed Cutthroat Island to overseas distributors, who were convinced to buy the distribution rights in their various countries with the promise that the film was a sure-fire hit. Michael Douglas originally agreed to play Shaw under two conditions: filming had to start immediately because he was available only for a limited time, and his character had to have the same amount of screen time as Davis. Douglas eventually pulled out, claiming that Davis's role was expanded at his character's expense, while Davis wanted to quit when Douglas did, but was contractually obligated to finish the film. After Douglas quit, Harlin was so preoccupied with trying to find a male lead that set construction and script work were done without his input. Consequently, Harlin did not like what he saw when shooting was set to begin, leading to expensive rebuilding and rewriting. Tom Cruise, Keanu Reeves, Russell Crowe, Liam Neeson, Jeff Bridges, Ralph Fiennes, Charlie Sheen, Michael Keaton, Tim Robbins, Daniel Day-Lewis and Gabriel Byrne all turned down the role of Shaw before Modine agreed to do the role, partly due to his experience as a fencer. Oliver Reed was originally cast for a cameo as Mordechai Fingers, but was fired after getting in a bar fight and attempting to expose himself to Davis while intoxicated. George Murcell eventually took his place. Shooting was delayed for various reasons, allowing the budget to spiral out of control. When Harlin fired the chief camera operator following a dispute, more than two dozen crew members quit. In addition, broken pipes caused raw sewage to pour into the water tank where the actors were supposed to swim. Harlin spent $1 million of his own money to rewrite the script, as Carolco was in so much debt that they could not afford to pay further. The film was shot on location in Malta and Thailand. Indoor scenes were shot in Kalkara Mediterranean Film Studios in Malta as well as in Pinewood Studios in England, UK. Harlin required actors to do their own stunts whenever possible. While promoting the film, Davis appeared on talk shows with clips of her doing stunts over and over (including one take where she fell out of a window too soon, rolled down the roof and under a carriage) and described the bruises and injuries she sustained while filming. 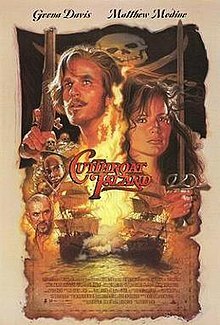 Cutthroat Island had a total production budget of $98 million (though some put the figure as high as $115 million) and the total U.S. gross was $10,017,322. In 2014, the LA Times listed the film as one of the most expensive box office flops of all time. It may have been a contributing factor to the demise of the film's production company, Carolco Pictures, and of Davis as a bankable star. It debuted at No. 13 at the US box office. The film received negative reviews from critics. Review aggregation website Rotten Tomatoes gives the film a 38% rating based on reviews from 39 critics, with an average rating of 4.5/10. Critics were unimpressed with the lack of chemistry between the leading actors, the one-dimensional villain, the unrealistic stunts (particularly a scene where Adams and Shaw jump through a scaffolding several stories high and come out unharmed) and the incoherent script. Todd McCarthy from Variety said "What seemed like a dubious proposition on paper plays even more dubiously onscreen, as Cutthroat Island strenuously but vainly attempts to revive the thrills of old-fashioned pirate pictures. Giving most of the swashbuckling opportunities to star Geena Davis, pic does little with its reversal of gender expectations and features a seriously mismatched romantic duo in Davis and Matthew Modine." whereas Time Out London commented that "we get Geena Davis doing the all-action honours, and a hotchpotch script that seems to think pirate movies are so funny in themselves the need for more humour is superfluous. The plot's well worn". Additionally, Janet Maslin of The New York Times said that "It's not possible to believe that Ms. Davis is the highly respected captain of a pirate ship, and it's not even fun to try.". Not all the reviews were negative, Roger Ebert gave the film a three-out-of-four-star rating, commenting that "This is, in short, a satisfactory movie – but it doesn't transcend its genre, and it's not surprising or astonishing. I saw it because that was my job and, having seen it, I grant its skill, and award it three stars on that basis. But unless you're really into pirate movies, it's not a necessary film". Susan Wloszczyna from USA Today stated that "If the sight of half-naked, tattooed sailors firing cannons at each other shivers your timbers, climb aboard. Even passable pirate movies don't sail by every day" awarding the film a 2.5 star rating out of 4. Harlin was nominated for a Golden Raspberry Award for Worst Director for his work on the film, but lost to Paul Verhoeven for Showgirls. In a radio interview in 2011, Harlin discussed the film's box office failure. He pointed out that Carolco was already in ruin before shooting even began, but had to make the film since financing from foreign investors was already in place. MGM, the film's distributor, was in the process of being sold and thus could not devote itself into financing a marketing campaign for the film. Carolco filed for Chapter 11 bankruptcy a month before Cutthroat Island's release. The failure of Cutthroat Island is also credited with significantly reducing the bankability and Hollywood production of pirate-themed films, which recovered only with the production of Disney's Pirates of the Caribbean: The Curse of the Black Pearl in 2003. A video game was made by Acclaim and released for the major platforms of the time (such as the Super NES, Sega Genesis, and Game Boy) to tie in with the film. It loosely follows the events of the film. ^ a b "AFI|Catalog". catalog.afi.com. Retrieved February 20, 2019. ^ "CUTTHROAT ISLAND (PG) (CUT)". British Board of Film Classification. March 13, 1996. Retrieved March 10, 2013. ^ a b c "Cutthroat Island". Box Office Mojo. Retrieved August 18, 2011. ^ Brennan, Judy (December 21, 2005). "Troubled Route to Pirate Epic 'Cutthroat'; Movies: As the swashbuckling adventure starring Geena Davis, directed by her husband, Renny Harlin, opens this weekend, financial woes surround its release". The Los Angeles Times. Retrieved May 24, 2011. ^ Daniel Jeffreys (April 9, 1996). "The vanity that led to a $100m bonfire". The Independent. Retrieved March 22, 2018. ^ "Cutthroat Island (John Debney)". Filmtracks. Retrieved March 3, 2009. ^ "Cutthroat Island (John Debney) soundtrack review". Scorereviews.com. Archived from the original on February 28, 2009. Retrieved March 3, 2009. ^ Other reviews by Mike Brennan (May 12, 2005). "SoundtrackNet : CutThroat Island Soundtrack". Soundtrack.net. Retrieved March 3, 2009. ^ "Movie Music UK - Cutthroat Island – John Debney". Moviemusicuk.us. Archived from the original on May 20, 2008. Retrieved March 3, 2009. ^ "The Top 10 Biggest Money-Losing Movies Of All Time". Time. March 21, 2012. ^ "The costliest box office flops of all time". latimes.com. Retrieved February 20, 2019. ^ Dutka, Elaine (December 25, 1995). "It's a Big Sigh of Relief for 'Exhale' : Box office: Whitney Houston film opens strongly and could take in $11 million or more for the four-day weekend. 'Nixon' and 'Cutthroat Island' perform poorly". Los Angeles Times. Retrieved June 14, 2012. ^ a b "Cutthroat Island (1995)". Rotten Tomatoes. Flixster. Retrieved December 16, 2015. ^ McCarthy, Todd (January 1, 1996). "Cutthroat Island". Variety. ^ "CutThroat Island, directed by Renny Harlin | Film review". Timeout.com. Retrieved January 13, 2017. ^ Maslin, Janet (December 22, 1995). "FILM REVIEW;Extravagant Demolition, With Woman As Top Pirate". The New York Times. ^ Ebert, Roger (December 22, 1995). "Cutthroat Island Movie Review (1995)". RogerEbert.com. Retrieved January 13, 2017. ^ The Business. "Action Director Renny Harlin" (radio interview). KCRW, Santa Monica, California. Retrieved October 17, 2011. ^ Business, Bloomberg (November 11, 1995). "Company news;carolco pictures files for bankruptcy protection". New York Times. ^ Kauffman, Jeffery (August 11, 2009). "Cutthroat Island (Blu-ray)". DVD Talk. Retrieved May 20, 2011. Parish, James Robert (2006). Fiasco - A History of Hollywood's Iconic Flops. Hoboken, New Jersey: John Wiley & Sons. pp. 359 pages. ISBN 978-0-471-69159-4. This page was last edited on 4 March 2019, at 08:08 (UTC).